Single-family house "this property", 3 storeys, terraced. 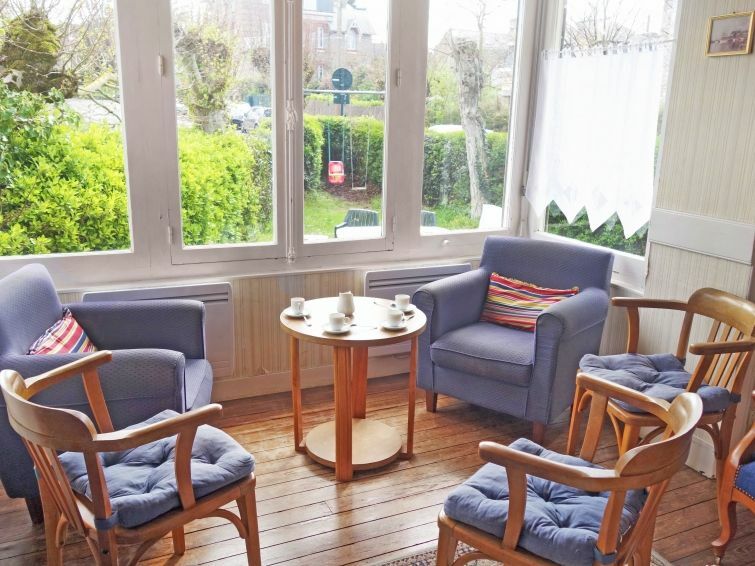 In the district of Saint Enogat, on the outskirts, 1.2 km from the centre of Dinard, in the residential district, 100 m from the sea, 100 m from the beach. Private: garden 300 m2 (fenced). Garden furniture, barbecue (swing), public parking on the road. Shop, grocery 500 m, restaurant 700 m, railway station 11 km, sandy beach "Port Riou" 100 m, indoor swimming pool 1.4 km, thermal baths 1 km. Golf course 6.2 km, surf school 350 m, tennis 1.5 km, minigolf 300 m, riding stable 1.5 km. Nearby attractions: Le Grand Aquarium de Saint Malo 9 km, Saint Malo 12 km, Dinan 22 km, Cap Fréhel/Fort La Latte 36 km, Cancale 23 km, Le Mont Saint Michel 60 km. 8-room house 115 m2 on 3 levels. Lounge with TV and DVD. Dining room. Kitchen (4 hot plates, oven, dishwasher, microwave, freezer, electric coffee machine). Shower/WC. Upper floor: 1 large room with 1 french bed (1 x 140 cm, length 190 cm). Exit to the balcony. 1 room with 1 double bed (2 x 80 cm, length 190 cm), hand-basin. Exit to the balcony. 1 small room with 1 bed (90 cm, length 190 cm). Bath/WC. 2nd upper floor: 1 room with 1 french bed (1 x 140 cm, length 190 cm), hand-basin. 1 room with 2 beds (90 cm, length 190 cm), hand-basin. 1 room with 1 double bed (2 x 80 cm, length 190 cm), hand-basin. Sep. WC. Electric heating. Terrace furniture, barbecue. Facilities: washing machine, dryer, children's high chair, baby cot for up to 3 year olds. Internet (WiFi, extra). Please note: smoke alarm. Wifi connection available from June to September.